Sachdev, Ricky A. Ruparelia, Risha Reid, Jemma E. Mpavenda, Davis Cinosi, Eduardo and Fineberg, Naomi A. 2019. A Transdiagnostic Approach to Obsessions, Compulsions and Related Phenomena. p. 183. Khan, Arif Fahl Mar, Kaysee Schilling, Joshua Brown, Walter A. and Cox, Dermot 2018. Does the rising placebo response impact antihypertensive clinical trial outcomes? An analysis of data from the Food and Drug Administration 1990-2016. PLOS ONE, Vol. 13, Issue. 2, p. e0193043. Poppelaars, Marlou Lichtwarck-Aschoff, Anna Kleinjan, Marloes and Granic, Isabela 2018. The impact of explicit mental health messages in video games on players’ motivation and affect. Computers in Human Behavior, Vol. 83, Issue. , p. 16. Blasini, Maxie Movsas, Shira and Colloca, Luana 2018. Placebo hypoalgesic effects in pain: Potential applications in dental and orofacial pain management. Seminars in Orthodontics, Vol. 24, Issue. 2, p. 259. Carlino, Elisa and Vase, Lene 2018. Neurobiology of the Placebo Effect Part I. Vol. 138, Issue. , p. 329. Meister, Ramona Jansen, Alessa Härter, Martin Nestoriuc, Yvonne and Kriston, Levente 2017. Placebo and nocebo reactions in randomized trials of pharmacological treatments for persistent depressive disorder. A meta-regression analysis. Journal of Affective Disorders, Vol. 215, Issue. , p. 288. Shaibani, Aziz Frisaldi, Elisa and Benedetti, Fabrizio 2017. Placebo response in pain, fatigue, and performance: Possible implications for neuromuscular disorders. Muscle & Nerve, Vol. 56, Issue. 3, p. 358. Hamers, Pauline C.M. Evenhuis, Heleen M. and Hermans, Heidi 2017. A multicenter randomized controlled trial for bright light therapy in adults with intellectual disabilities and depression: Study protocol and obstacle management. Research in Developmental Disabilities, Vol. 60, Issue. , p. 96. Wilhelm, Marcel Winkler, Alexander Rief, Winfried and Doering, Bettina K. 2016. Effect of placebo groups on blood pressure in hypertension: a meta-analysis of beta-blocker trials. Journal of the American Society of Hypertension, Vol. 10, Issue. 12, p. 917. Chojnacka, Magdalena Antosik-Wójcińska, Anna Z. Dominiak, Monika Bzinkowska, Dorota Borzym, Agnieszka Sokół-Szawłowska, Marlena Bodzak-Opolska, Gabriela Antoniak, Dorota and Święcicki, Łukasz 2016. A sham-controlled randomized trial of adjunctive light therapy for non-seasonal depression. Journal of Affective Disorders, Vol. 203, Issue. , p. 1. Benedetti, Fabrizio Carlino, Elisa and Piedimonte, Alessandro 2016. Increasing uncertainty in CNS clinical trials: the role of placebo, nocebo, and Hawthorne effects. The Lancet Neurology, Vol. 15, Issue. 7, p. 736. Clarke, Janine Proudfoot, Judith and Ma, Howard 2016. Mobile Phone and Web-based Cognitive Behavior Therapy for Depressive Symptoms and Mental Health Comorbidities in People Living With Diabetes: Results of a Feasibility Study. JMIR Mental Health, Vol. 3, Issue. 2, p. e23. Rutherford, Bret R Bailey, Veronika S. Schneier, Franklin R. Pott, Emily Brown, Patrick J. and Roose, Steven P. 2015. INFLUENCE OF STUDY DESIGN ON TREATMENT RESPONSE IN ANXIETY DISORDER CLINICAL TRIALS. Depression and Anxiety, Vol. 32, Issue. 12, p. 944. Cox, Nigel and Webb, Lucy 2015. Poles apart: does the export of mental health expertise from the Global North to the Global South represent a neutral relocation of knowledge and practice?. Sociology of Health & Illness, Vol. 37, Issue. 5, p. 683. 2014. Cognitive Neuroscience and Psychotherapy. p. 595. Jubb, Jayne and Bensing, Jozien M. 2013. The sweetest pill to swallow: How patient neurobiology can be harnessed to maximise placebo effects. Neuroscience & Biobehavioral Reviews, Vol. 37, Issue. 10, p. 2709. Ujeyl, M. and Müller-Oerlinghausen, B. 2013. Erst die Evidenz prüfen – dann die Therapie empfehlen. Der Schmerz, Vol. 27, Issue. 2, p. 202. Andrews, G. (1993) The essential psychotherapies. British Journal of Psychiatry, 162, 447–451. Andrews, G. & Jenkins, R., (eds) (1999) The Management of Mental Disorders. London: World Health Organization Collaborating Centre in Mental Health. Andrews, G. Sanderson, K., Slade, T., et al (2000) Why does the burden of disease persist? Relating the burden of anxiety and depression to effectiveness of treatment. Bulletin of the World Health Organization, 78, 446–454. Cochrane, A. L. (1989) Effectiveness and Efficiency: Random Reflections on Health Services. London: British Medical Journal. 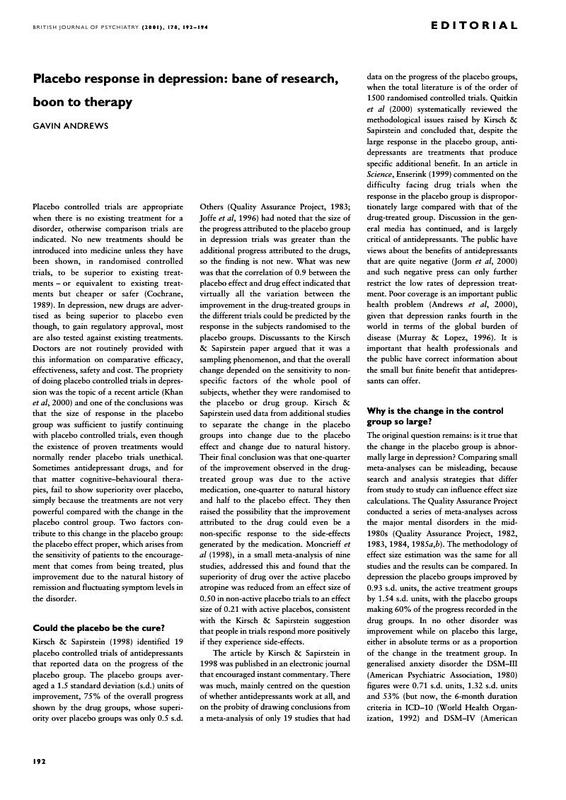 Enserink, M. (1999) Can the placebo be the cure? Science, 284, 238–240. Joffe, R., Sokolov, S. & Streiner, D. (1996) Antidepressant treatment of depression: a meta-analysis. Canadian Journal of Psychiatry, 41, 613–616. Jorm, A. F., Angermeyer, M. & Katschnig, H. (2000) Public knowledge of and attitudes to mental disorders: a limiting factor in the optimal use of treatment services. In Unmet Need in Psychiatry (eds Andrews, G. & Henderson, A. ), pp. 399–416. Cambridge: Cambridge University Press. Kendler, K. S., Walters, E. E. & Kessler, R. C. (1997) The prediction of length of major depressive episodes: results from an epidemiological survey of female twins. Psychological Medicine, 27, 107–117. Khan, A., Warner, H. A. & Brown, W. A. (2000) Symptom reduction and suicide risk in patients treated with placebo in antidepressant clinical trials. Archives of General Psychiatry, 57, 311–330. Kirsch, I. & Sapirstein, G. (1998) Listening to prozac but hearing placebo: a meta-analysis of antidepressant medication. Prevention & Treatment, I, Article 0002a. http://journals.apa.org/prevention/volume1/pre0010002a.html. Kraemer, H. C. (2000) Statistical analysis to settle ethical issues? Archives of General Psychiatry, 57, 327–328. McLeod, J. D., Kessler, R. C. & Land is, K. R. (1992) Speed of recovery from major depressive episodes in a community sample of married men and women. Journal of Abnormal Psychology, 101, 277–286. Moncrieff, J., Wessely, S. & Hardy, R. (1998) Meta-analysis of trials comparing antidepressants with active placebos. British Journal of Psychiatry, 172, 227–231. Murray, C. J. L. & Lopez, A. D. (1996) Global Burden of Disease. Cambridge, MA: Harvard University Press. Mynors-Wallis, L. M., Gath, D. H., Lloyd-Thomas, A. R., et al (1995) Randomised controlled trial comparing problem solving treatment with amitriptyline and placebo for major depression in primary care. British Medical Journal. 310, 441–445. Quality Assurance Project (1982) A treatment outline for agoraphobia. Australian and New Zealand Journal of Psychiatry, 16, 25–33. Quality Assurance Project (1983) A treatment outline for depressive disorders. Australian and New Zealand Journal of Psychiatry, 17, 129–146. Quality Assurance Project (1984) A treatment outline for the management of schizophrenia. Australian and New Zealand Journal of Psychiatry, 18, 19–38. Quality Assurance Project (1985a) Treatment outlines for the management of anxiety states. Australian and New Zealand Journal of Psychiatry, 19, 138–151. Quality Assurance Project (1985b) Treatment outlines for the management of obsessive–compulsive disorders. Australian and New Zealand Journal of Psychiatry, 19, 240–253. Quitkin, F. M., Rabkin, J. G., Gerald, J., et al (2000) Validity of clinical trials of antidepressants. American Journal of Psychiatry, 157, 327–337. Thase, M. E. (1999) How should efficacy be evaluated in randomized clinical trials of treatments for depression? Journal of Clinical Psychiatry, 60 (suppl. 4): 23–31. World Health Organization (1992) International Classification of Diseases and Related Disorders (ICD–10). Geneva: World Health Organization.